The LX65 Series 6" ACF has an Advanced Coma-Free (ACF™) optical design offering the coma-free pinpoint star images and flatter image fields while reducing astigmatism and eliminates diffraction spikes. Features include a 6" (152mm) aperture, 1524mm focal length, and f/10 focal ratio. 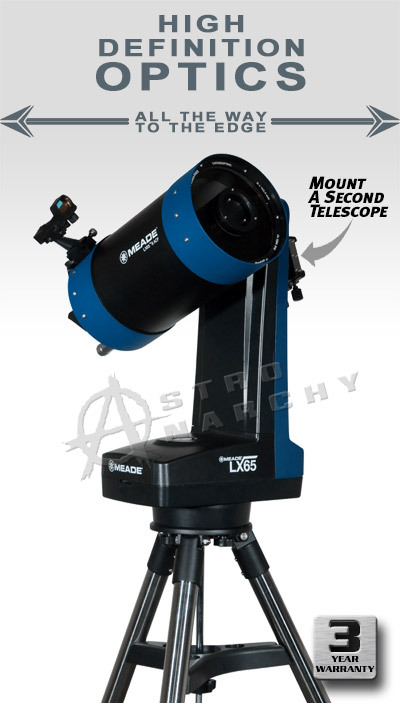 Equipped with an internal single speed focuser and Ultra High Transmission Coatings (UHTC™) for the improvement of brighter star clusters, more fine detail in nebulae, and greater surface features on planets. Includes (1) 26mm,1.25" Super Plossl eyepiece and a red-dot viewfinder along with a vixen-style dovetail. Diagonal:	Meade #07202 Diagonal Mirror, 1.25"